^ a b c d e f g h i j k l m n Carbonaro, Theresa M.; Gatch, Michael B. (2016). 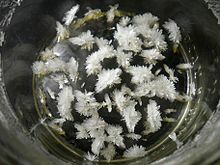 “Neuropharmacology of N,N-dimethyltryptamine”. Brain Research Bulletin 126 (Pt 1): 74–88. doi:10.1016/j.brainresbull.2016.04.016. PMC: 5048497. PMID 27126737. https://www.ncbi.nlm.nih.gov/pmc/articles/PMC5048497/. ^ a b Servillo, Luigi; Giovane, Alfonso; Balestrieri, Maria Luisa; et al. (2012). “N-Methylated Tryptamine Derivatives in Citrus Genus Plants: Identification of N,N,N-Trimethyltryptamine in Bergamot”. Journal of Agricultural and Food Chemistry 60 (37): 9512–9518. doi:10.1021/jf302767e. PMID 22957740. ^ a b c Szabo, Attila; Kovacs, Attila; Riba, Jordi; et al. (2016). “The Endogenous Hallucinogen and Trace Amine N,N-Dimethyltryptamine (DMT) Displays Potent Protective Effects against Hypoxia via Sigma-1 Receptor Activation in Human Primary iPSC-Derived Cortical Neurons and Microglia-Like Immune Cells”. Frontiers in Neuroscience 10: 423. doi:10.3389/fnins.2016.00423. PMC: 5021697. PMID 27683542. https://doi.org/10.3389/fnins.2016.00423. ^ a b c レスター・グリンスプーン、ジェームズ・B. バカラー 『サイケデリック・ドラッグ-向精神物質の科学と文化』 杵渕幸子訳、妙木浩之訳、工作舎、2000年。43-45, 82頁。ISBN 978-4875023210。 Psychedelic Drugs Reconsidered, 1979. ^ Stafford, Peter (1992). Psychedelics Encyclopedia, Third Expanded Edition. Ronin Publishing. ISBN 0914171518. ^ Franzen, F. R.; Gross, H. (1965). “Tryptamine, N,N-Dimethyltryptamine, N,N-Dimethyl-5-hydroxytryptamine and 5-Methoxytryptamine in Human Blood and Urine”. Nature 206: 1052-105. doi:10.1038/2061052a0. ^ ジム・デコーン 『ドラッグ・シャーマニズム』 竹田純子、高城恭子訳、1996年、259頁。ISBN 4-7872-3127-8。 Psychedelic Shamanism, 1994. ^ Dean JG (2018). “Indolethylamine-N-methyltransferase Polymorphisms: Genetic and Biochemical Approaches for Study of Endogenous N,N,-dimethyltryptamine”. Front Neurosci: 232. doi:10.3389/fnins.2018.00232. PMID 29740267. https://doi.org/10.3389/fnins.2018.00232. ^ “Biosynthesis of N,N-dimethyltryptamine (DMT) in a melanoma cell line and its metabolization by peroxidases”. Biochemical Pharmacology 88 (3): 393–401. (2014). doi:10.1016/j.bcp.2014.01.035. PMID 24508833. ^ a b c d e f g h i j k Kärkkäinen J.; Forsström T.; Tornaeus J.; Wähälä K.; Kiuru P.; Honkanen A.; Stenman U.-H.; Turpeinen U. et al. (April 2005). “Potentially hallucinogenic 5-hydroxytryptamine receptor ligands bufotenine and dimethyltryptamine in blood and tissues”. Scandinavian Journal of Clinical and Laboratory Investigation 65 (3): 189–199. doi:10.1080/00365510510013604. PMID 16095048. ^ Wyatt R.J.; Mandel L.R. ; Ahn H.S. ; Walker R.W. ; Vanden Heuvel W.J. (July 1973). “Gas chromatographic-mass spectrometric isotope dilution determination of N,N-dimethyltryptamine concentrations in normals and psychiatric patients” (PDF). Psychopharmacologia 31 (3): 265–70. doi:10.1007/BF00422516. PMID 4517484. http://www.springerlink.com/content/j686565850024164/fulltext.pdf. ^ Angrist B.; Gershon S.; Sathananthan G.; Walker R.W. ; Lopez-Ramos B.; Mandel L.R. ; Vandenheuvel W.J. (May 1976). “Dimethyltryptamine levels in blood of schizophrenic patients and control subjects” (PDF). Psychopharmacology 47 (1): 29–32. doi:10.1007/BF00428697. PMID 803203. http://www.springerlink.com/content/kw2nm252m3248864/fulltext.pdf. ^ Forsström T.; Tuominen J.; Karkkäinen J. (2001). “Determination of potentially hallucinogenic N-dimethylated indoleamines in human urine by HPLC/ESI-MS-MS”. Scandinavian Journal of Clinical and Laboratory Investigation 61 (7): 547–56. doi:10.1080/003655101753218319. PMID 11763413. ^ Oon M.C. ; Rodnight R. (December 1977). “A gas chromatographic procedure for determining N, N-dimethyltryptamine and N-monomethyltryptamine in urine using a nitrogen detector”. Biochemical Medicine 18 (3): 410–9. doi:10.1016/0006-2944(77)90077-1. PMID 271509. ^ Smythies J.R.; Morin R.D. ; Brown G.B. (June 1979). “Identification of dimethyltryptamine and O-methylbufotenin in human cerebrospinal fluid by combined gas chromatography/mass spectrometry”. Biological Psychiatry 14 (3): 549–56. PMID 289421. ^ Christian S.T. ; Harrison R.; Quayle E.; Pagel J.; Monti J. (October 1977). “The in vitro identification of dimethyltryptamine (DMT) in mammalian brain and its characterization as a possible endogenous neuroregulatory agent”. Biochemical Medicine 18 (2): 164–83. doi:10.1016/0006-2944(77)90088-6. PMID 20877. ^ Servillo, Luigi; Giovane, Alfonso; Balestrieri, Maria Luisa; et al. (2013). “Citrus Genus Plants Contain N-Methylated Tryptamine Derivatives and Their 5-Hydroxylated Forms”. Journal of Agricultural and Food Chemistry 61 (21): 5156–5162. doi:10.1021/jf401448q. PMID 23682903. ジョン・ホーガン 『科学を捨て、神秘へと向かう理性』 竹内薫訳、徳間書店、2004年11月。ISBN 978-4198619503。Rational mysticism, 2003.